First, this trip will take you into the heart of the country, to Piazza Amerina. Here, you will visit one of the most ravishing villas from Roman times: Villa del Casale del Imperiale. 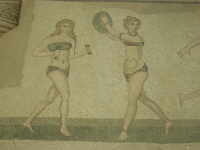 The floor mosaics are regarded one of the most beautiful and best preserved worldwide. They cover about 3.500 m² and make the ancient Roman times come alive: You will gain an amazing insight into their ideas about living, loving and hunting! 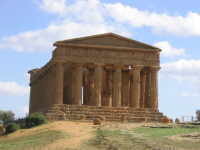 The trip continues through a mostly rough landscape to Agrigento, one of Sicily's most enchanting sights. The legend says that the ancient Greeks ate to die tomorrow but they surely built for eternity! The ancient Greek name for Agrigento was Agragas, which was a veritable metropolis in antique times. You have a chance to see probably the most romantic temple grounds in Sicily: The Temples of Juno and Hera and then the Temple of Concordia which is one of the best preserved in the world. You pass Villa Aurea and will see the Temple of Hercules which was regarded one of the most beautiful temples in antiquity according to Cicero. The last stops are the temple of Zeus, which was the biggest doric temple during ancient Greek times and the Temple of Castor and Pollux and the Temple of Epfaistos. After a brief break the bus will take you back to Cefalù.